For those of us who care about such things, the inflorescence is a raceme. That means it is indeterminate and continues to lengthen as the flowers open. 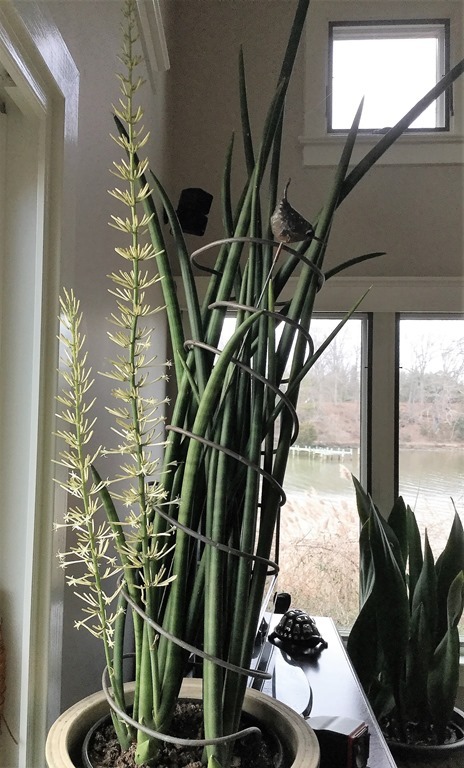 Today, the tallest flower stalk is nearly 40 inches tall, and the shorter one 25 inches. Both are still lengthening. The individual flowers are carried in little clusters up and down the main stem, with buds mixed with spent flowers. Individual flower buds are 2 inches long. When buds open, the individual petals roll back, so the flowers are slightly shorter in bloom. Sansevierias in general couldn’t be easier to care for. Give them well-drained soil and let it dry out between waterings. Fertilize sparingly. Give the plants bright light in winter (my S. cylindrica is next to a south-facing window) and partial shade in summer. All my sansevierias are outdoors from spring to fall in a spot that receives morning sun and afternoon shade. They do spread by rhizomes, but are pretty content to remain in the same pot for years. I saw pictures of S. cylindrica on the internet with leaves that were braided. As you can see by my picture, I manage my plant with a spiral of copper pipe to keep the leaves from spreading too widely. S. cylindrica is reported to be a good air purifier. (Plants Rescue has more information on this along with extensive cultural information.) According to Portland Nursery, the species also has been grown for centuries “because they are believed to share the same eight virtues as Taoist deities, the Eight Immortals.” Whatever benefits sansevierias bring to the home garden—great foliage, good luck, air purification, or surprise flowers—they make welcome additions to my indoor garden.